Director Terry George received a warm welcome back to the Toronto International Film Festival, with a little boost from Christian Bale and Oscar Isaac at his side. 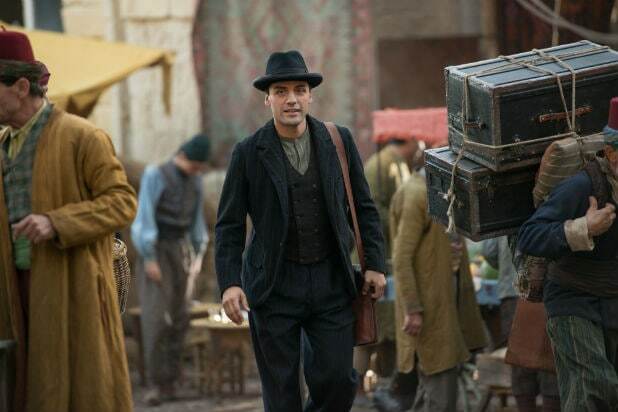 The stars topline George’s “The Promise,” about a love triangle that plays out against the horrors of the Armenian Genocide. The men are joined by a capable and graceful newcomer in Charlotte Le Bon. The Roy Thomson Hall crowd was glad to be reminded of George’s last TIFF offering, 2004’s “Hotel Rwanda,” which took the audience prize that year. Twelve years later, George has ratcheted up his ambitions. Set up by the late Kirk Kerkorian and seen through by “Black Swan” producer Mike Medavoy (among others), “The Promise” is a lush and satisfying epic that ticks a lot of boxes (meticulous, opulent details from the final days of the Ottoman Empire, elaborate costumes, sweeping landscapes, etc). The surprise offering is a history lesson that says, via title cards, that 1.5 million Armenians were forced from their villages and slaughtered by the Turkish government — which, to this day, does not acknowledge that the event happened — during and after World War I. Over nearly two hours, the opulence gives way to looted and burned homes and shops, fatal marches to the Syrian desert and a wrenching struggle to hold on to family and tradition. As far as the narrative is concerned, Issac plays Michael, an aspiring medical student who agrees to wed a sheepish local girl (Angela Sarafyan). His dowry will help pay for medical school, a program he insists will only take two years to complete, then he’ll return home to marry. Staying with cousins in Constantinople, Michael meets a glamorous but accessible family friend, Ana (a dancer with a French lilt thanks to her years training in Paris, but a proud Armenian nonetheless). She’s soft and stunning but still reminiscent of home. Michael is toast. The problem is Ana’s boyfriend, the fiery Associated Press correspondent Chris (Bale). The dogged reporter is catching wind of growing aggression from the Ottoman government toward the Armenians. The love triangle deepens in step with the crimes and abuse inflicted on the population. Isaac further solidifies himself as a top leading man, shifting between earnest doctor and obedient son (to a perfectly cast matriarch in Shohreh Aghdashloo) and devoted lover. Isaac’s best moments come at Michael’s worst — a scene by a river discovering his slain townsfolk is devastating and memorable. Bale comes in for heavy lifting (literally, as in food and water for Armenian orphans at one point) and does seem to enjoy rabble rousing as a relentless journalist, especially in a party scene taunting German officers in their native tongue. Le Bon is a great damsel with minimal distress, and her Ana has a lot to offer by way of insight and compassion. “We let the film speak for itself,” George said on stage with his cast. The movie wraps with another title card that perhaps carries the most important message. It’s a quote from Armenian-American novelist William Saroyan.